Thomas Sauerhoefer has over 30 years experience in Schutzhund Training. He has put 350 titles on dogs in Germany and America. Thomas is a specialist in Schutzhund protection work, especially problem dogs. Helping weak dogs with bite problems, and dogs with no outs. He is an expert for both show and working lines. From a BH to Schutzhund 3, I will train your dog to achieve the best score the dog is capable of handling. If the dog fails during a trial when attempting to earn a BH or Schutzhund title, I guarantee that I will continue to work and train the dog until we pass. Your dog and I are a team when we are out on the field and I will work to the best of my ability to make sure that we both perform at our best level. BH – $2,000 includes all expenses. SchH1 – $6,000 includes all expenses. While dogs of other breeds are also admitted to Schutzhund trials, this breed evaluation test was developed specifically for the German Shepherd Dog. 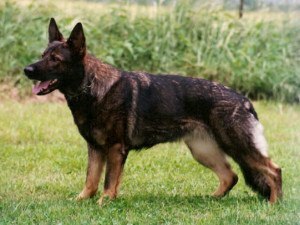 Schutzhund is intended to demonstrate the dog’s intelligence and utility. As a working trial, Schutzhund training measures the dog’s mental stability, endurance, structural efficiencies, ability to scent, willingness to work, courage and trainability. This working dog sport offers an opportunity for dog owners to train their dog and compete with each other for recognition of both the handler’s ability to train and the dog’s ability to perform as required. It is a sport enjoyed by persons of varied professions, who join together in a camaraderie born of their common interest in working with their dogs. Persons of all ages and conditions of life — even those with significant disabilities — enjoy Schutzhund as a sport. Often, it is a family sport.